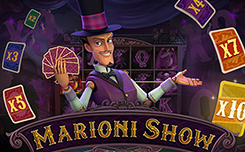 The game, the Marioni show, has five reels and 10 paylines. On the screen of the game, you can see various fairy-tale characters: the dragon, the sorceress, the satyr of the ancient Greek myths, the princess, the good and evil knights. Wild, appears only in three middle columns, it replaces other pictures, except for the scatterers. 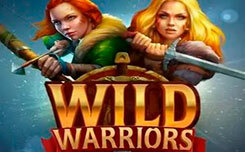 Extra Wild, acts as an additional wild that occurs during free-spins. Scatter starts free spins. They are started by three scatters. Also, the player receives for them a payment of five common bets. Bonus Game – The game starts when knights meet face to face on the screen. You need to choose one of them. A good warrior can give you a multiplier of x15, and a dark warrior gives free spins. Next, you will play cards, trying to defeat your opponent. The rules are very simple: one card will be compared to determine the winner. Even if you lose, you are guaranteed a consolation prize. Free Spins – Three scatters start ten free spins. 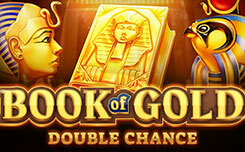 Based on the results of the bonus game you can get the right to participate in fifteen free spins. The multipliers in the maps increase to x3, x5 and x7. Extra wild, appears on the first drum and adds from one to three spins to the remaining amount. 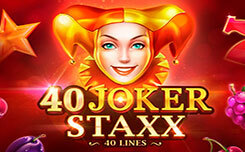 An interesting system of additional multipliers, various types of pictures, fascinating free spins and an unusual bonus round – these features of the game will surely appeal to you.